A legal story that broke last week in reference to a Twitter account and its ownership brings up some interesting questions about how brands and companies should consider or engage Twitter – or perhaps all of social media. The specific lawsuit that was written about in outlets like the New York Times and BBC focuses on the legal challenge and its possible precedents in relation to a user’s 17,000+ followers that were initially generated while he was working for a company. Upon leaving the company (phonedog.com) eight months ago, he was given permission to maintain the account and even changed the name to be completely his own. The parameters of the suit are seemingly too convoluted to focus on whether the ruling will set any clear legal precedence, but those same questions provide a solid basis for ground rules on social branding. Before getting into assigning a worth to your tweets, let’s look at a couple of the main foundations for your social outreach. There are a number of routes you can take with the two most popular being an official voice of the company or the use of a personality – either within or outside of the company. Both offer strong opportunities but both are also rife with challenges. The official voice of the company works because it is always supposedly from you (the company). Maybe one of its values is that it can never up and leave you – taking its followers along – but depending on the platform, the company voice might not be considered as authentic or it might be thought of as too dry and unimportant. It takes more than just posting to engage a large base and only consistent communication complemented by other outreach can build a passionate following. Knowing that, social outreach is not a medium to fly into without a strategy and discussion of tone, frequency and communication. It also cannot be considered as something that you can constantly change. The option of working through other entities might work for you if your goal is to reach a large group of people quickly – perhaps via someone they trust. There is an element of control you will be lacking in this engagement, but with the proper partner, it can lead to quick engagement of larger groups if that is what you are looking for. Of course, you are effectively leveraging an individual’s personae to communicate with readers or consumers who will relate positively with you company or product. It’s all great when the positives line up nicely with your product or releases, but you won’t have total control over it. With either of these – and all other forms and formats – there is strong value that is completely dependent on what you are trying to convey and how you want to convey it. Either way, strategy is the most important and shouldn’t rely on your hiring of someone to just write. If you hire anyone, it should be a social strategist and they should formulate the strategy only have a bunch of meetings with the marketing, publicity groups or whatever combination makes sense for your organization. Perhaps only after you’ve defined the strategy can you place a hard value on the elements of your social campaign. Unfortunately, there is no one metric that correlates with everyone’s needs. 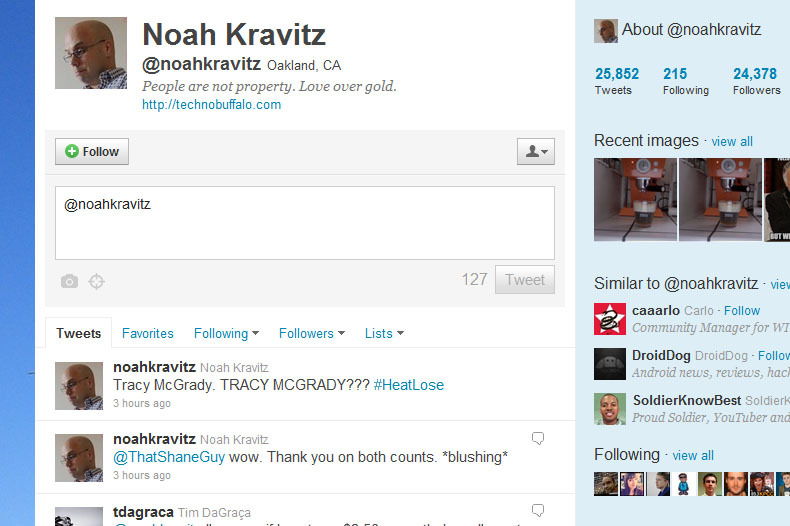 In the case of Noah Kravitz, there is no way his readers are worth $2.50 each – the amount Phonedog is seeking from Kravitz) and I personally don’t believe the company can lay claim to anything he has done with that list because it has always been just him – even with his old user name being both his name and the company’s name, the company was not represented without Noah’s name in there. As we don’t know the specifics, we can’t fully judge, but I don’t see grounds for the company to get any compensation. They didn’t hire him specifically to start-up a Twitter feed for them and there didn’t seem to be any bespoke characteristics they might have developed for Kravitz to speak of when representing the business full and not himself. Establish a clear social strategy for official communications and also for other employees who might invoke the company’s business when tweeting on their own behalf. Besides mitigating PR issues, not setting clear parameters for employees discussing company issues (or not) there may be competitive or SEC issues that could arise if they share too much. Make sure your internal and external strategies are clear and consistent. If you start a social presence from scratch, make sure it has a specific POV or narrative that is consistent with your brand. Whether in tone of voice, personality or whatever, that specific element effectively instills what could be considered social IP. Even if you are engaging a person to create a following, establish it as a work-for-hire so that ownership is still in the control of the company if that person decides to bolt. If going the route of bootstrapping on existing outlets, ensure that they work with your communication, but also make sure that there is no confusion who’s doing the communicating for who. In this case, an outside source is communicating on the company’s behalf – so the company cannot expect to have ownership and control of the outside source. Clear expectations are key – especially when determining if you want to transition this quick-reach solution to the long-term. As there are complexities related to the long-term when using outside sources, its one more reason to have a clear strategy prior to engaging social outreach. Sadly, there are many more questions than answers when it comes to social and that’s why its imperative to lay a solid foundation or ground rules for your social branding. Whether it is corporate updates, product information, help or just the weather that you want to provide for your social minions, keep yourself out of a legal quandary by laying down strong ground rules for your business and employees.